Reflections Around the Campfire: Today is Our 1st Anniversary! Here's the Story to Go Along With It! Today is Our 1st Anniversary! Here's the Story to Go Along With It! Those of you who are astute and regular readers are remembering that Alan and I have two children who are young adults now and you’re probably figuring that, while there is a chance we were married just a year ago, it’s not likely. Right you are! Our first wedding anniversary was a moment in the rearview mirror of time many years ago and we’re currently working toward #39. (Would you believe me if I told you I got married when I was 5 years old? No? I didn’t think so, but it was worth a shot.) Today, though, we really are celebrating a 1st anniversary. The story’s a long one, so you might want to grab a fresh cup of coffee before you continue reading. It happens as nature intends. As our children age, they gain more skills (driving) and more responsibilities (employment) which allow them to earn money and spend more time with their friends. As I said, I’m sure this gradual transition to independence occurs as nature intended. As the kids grew up and spread their wings, they began spending less time camping and traveling with us. (Could someone please pass me a tissue? I think I have something in my eye.) At first, Alan and I looked longingly after them. Then, we started looking longingly at the space their bunks occupied. Hmmm. 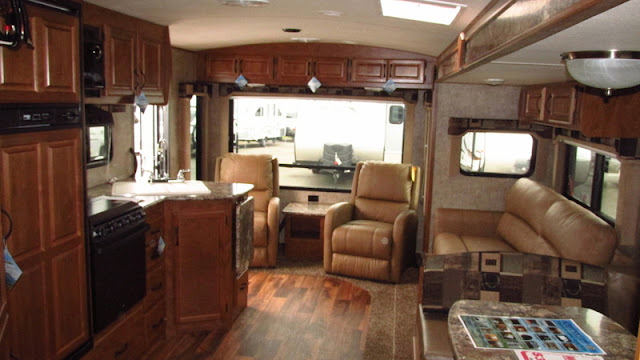 Wouldn’t it be nice if we had an RV with some extra living space for us to relax in? Something that would still sleep five or six people but would be a little more comfortable and spacious and great for hanging out at the lake? As it happens so many times, thoughts become ideas which turn into dreams. Neither Alan nor I were interested in a second home in retirement. We love the mountains, but we love the oceans, too. And all the forests and lakes in between them. No, we agreed that the retirement home we needed was one on wheels that could be parked in the mountains and at the oceans and near all the forests and lakes in between. And so, the quest began. Both Alan and I are detail oriented people. Plus, I’m an avid reader which is a huge advantage when it comes to research. We tend not to be impulsive and will freely admit to picking a situation apart until there’s no other way to look at it. 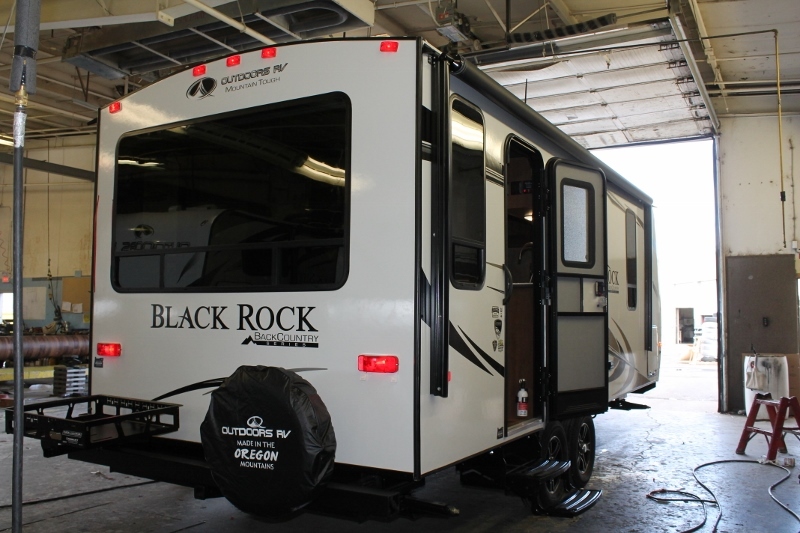 These traits came in handy as we settled on Plan A and worked for a period of almost two years forging our dream into a reality – finding the perfect RV just for us. Because we travel with bikes, a portable waste tank, at least one generator in the bed of our pickup truck and a couple of kayaks strapped down to the TracRacs on the truck, we knew that we’d be looking at travel trailers. A motorized RV just doesn’t work well for us, and a set-up for a fifth wheel would eliminate most of the storage space in the truck bed and require us to find some other place to stow much of our gear. 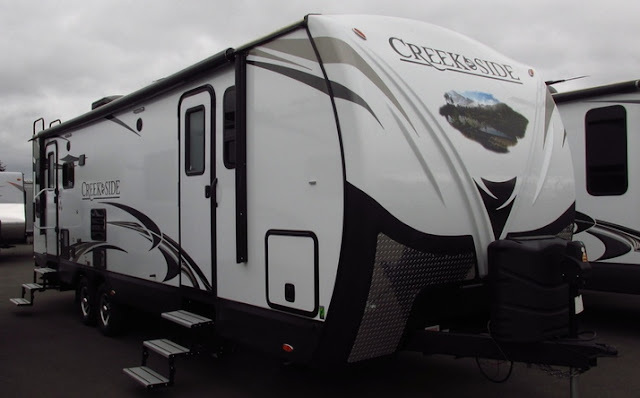 Despite the fact that there are an awful lot of travel trailers on the market, we were determined to shop well and find the one that would best meet our needs and as many of our wants as possible. For several years prior to this, my family would graciously put up with my sighs and comments as I admired every rig I saw with a big back window. I could just picture backing one of our own into a favorite lakefront site and enjoying the sunrise over the distant mountains. By the time we decided to actually shop for a new RV, I already had the first requirement nailed down. A BIG back window was the #1 priority. That was followed closely by a couple of recliners from which we could enjoy the views offered by that window. Alan wanted a bedroom with a window on each side for better air circulation and I preferred a bathroom that contained the toilet, sink and shower all in one room – not split by a hallway. Last, but not least, the spaghetti pot needed to fit. (Don’t laugh. If there’s an Italian family involved, chances are the spaghetti pot will need to come along.) So, our priorities were not endless, but they were items we were pretty much set on. What followed were countless hours spent online looking at the floor plans of travel trailers from many different manufacturers along with a well spent two days at “America’s Largest RV Show” in Hershey, Pennsylvania. 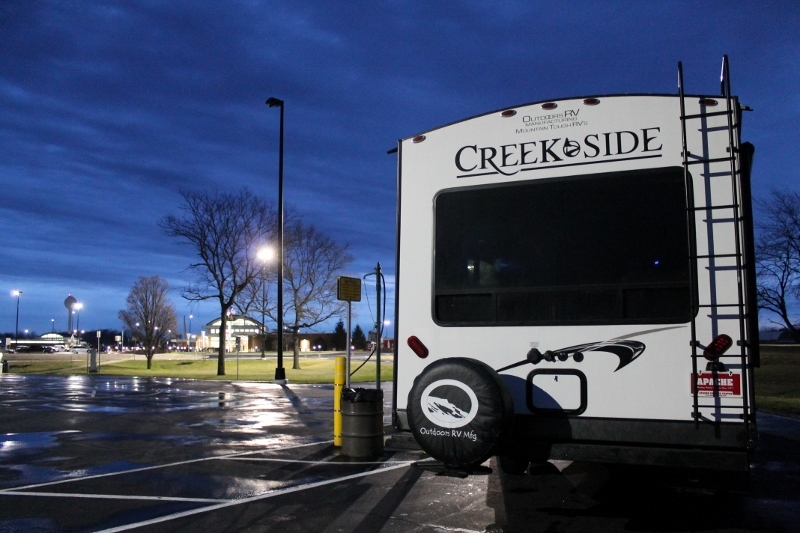 We loved our Jayco, but really wanted to shop the current market as much as possible since we realized that much had changed in the RV industry since we bought that travel trailer ten years earlier. During my research, I stumbled upon a small company in eastern Oregon called Outdoors RV Manufacturing (ORV) which made travel trailers and fifth wheels for “outdoor enthusiasts,” mainly in the Pacific Northwest and Canada. We were impressed by the number of items that came standard on the company’s units and really liked the interior design and colors in their travel trailers. We were particularly drawn to the Creek Side 26RLS that was just under 32’ in length. 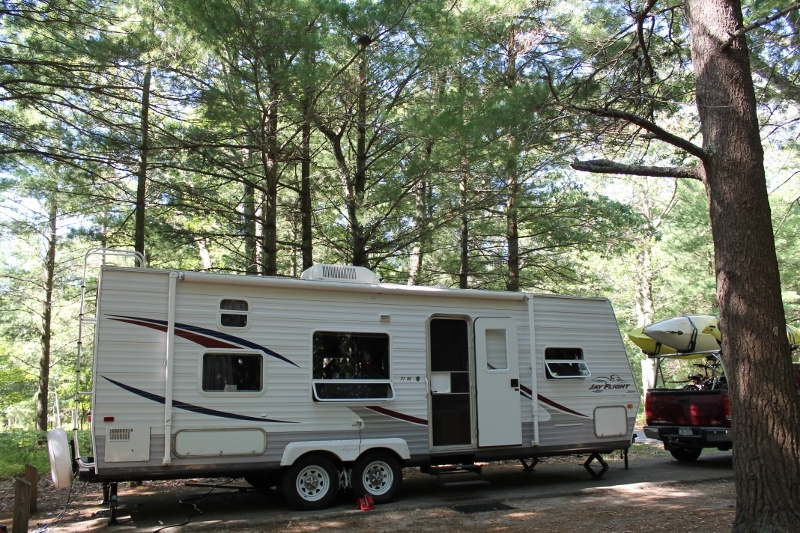 It had the sleeping space we were looking for and came with a dinette, a sofa and (best of all!) two comfy-looking recliners nestled next to the big back window. But the closest ORV dealer was in Colorado. Let’s see, that would be 7 states and nearly 2,000 miles away. On to Plan B – find something closer. We moved on to Plan B - but it really is gorgeous, isn't it?! I continued my online research, and Alan and I kept attending the larger RV shows in the northeast. Somewhere along the line, the ORV Creek Side 26RLS became our benchmark and we were having a really hard time finding anything else that came close. Although there were two Jayco’s that had a similar floor plan, one had a really narrow bedroom closet and the other had a split bath across the width of the trailer – both major disadvantages to us. On to Plan C – maybe we could figure out a way to look at a Creek Side. Our third cross country National Parks camping trip had been planned for the summer of 2017. 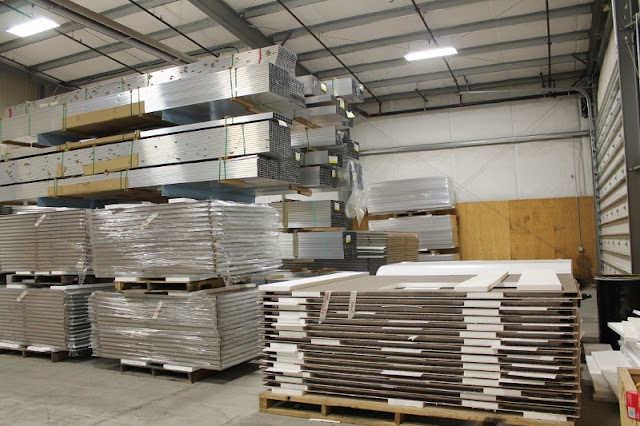 Because ORV had numerous dealers in California and the Pacific Northwest, we decided that we would visit one or more dealers while we were on that trip. If we liked the Creek Side as much as we thought we would, we’d order one and travel cross country again to pick it up once it had been built and delivered to the dealer. Since Alan and I are road trippers by nature, this seemed perfectly reasonable to us and we had no cause for concern. 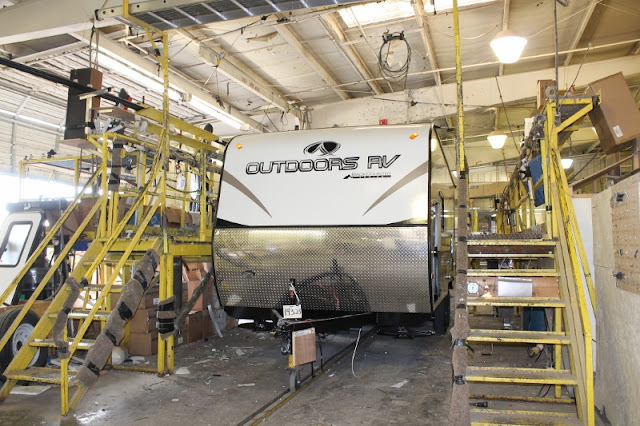 So, we checked with the company to see how it handled long distance warranty work and were relieved to find that it could be performed by any regular RV repair facility as long as ORV was contacted before the work began. Perfect. Just think . . . someday, one of these could be ours! Early last year, many months before our scheduled cross country trip was to begin, ORV threw us a curve. 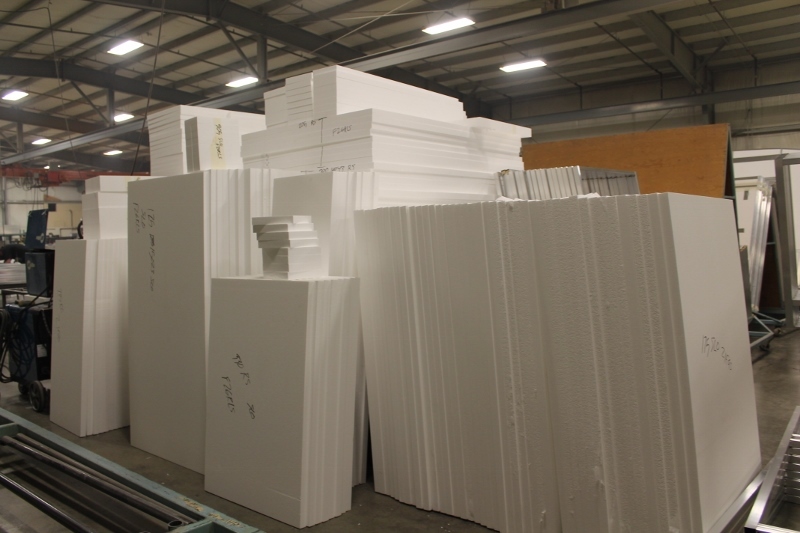 They were changing up their production line and “our” Creek Side 26RLS was no longer going to be manufactured. What?! 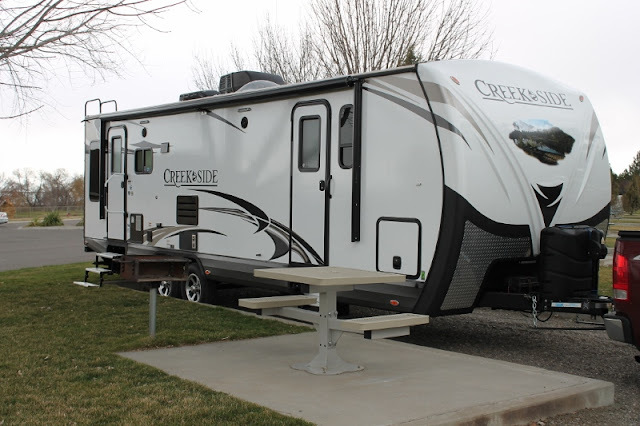 After spending months upon months researching travel trailers online, scouring RV shows and finally deciding on a plan of action, the proverbial rug was pulled out from under us. Although ORV was still going to manufacture Timber Ridge travel trailers with that floor plan, the Timber Ridge is a higher trim level (read that as “higher cost”) and the new units would have updated cabinetry and interior trim (read that as “what have they done to our Creek Side?!). Alan and I were nearly in a panic. What to do?! We needed Plan D – and fast. Our options were limited. We could (1) fall back on one of the Jayco’s, but we agreed that we would be settling for something less than what we really wanted; (2) stick with Plan C, but look at the more expensive Timber Ridge when we were out on the west coast; or (3) start calling dealers to see if any of them still had a Creek Side 26RLS on their lot. None of the options were ideal, but the winds had changed and we needed to adjust the sails. I could pull a fast one, at this point, and tell you that the story will be concluded in the next post. But I won’t. This is a story of a dream - and perseverance and adventure – and it gives me great pleasure to share it with you. Theodore Roosevelt once said, “Life is an adventure . . . Accept it in such a spirit.” And so we did. Plan D - There is a road trip in our future. The first dealer we called had just recently sold the Creek Side we saw in their online inventory. That one was the closest to our home and it was in Idaho. 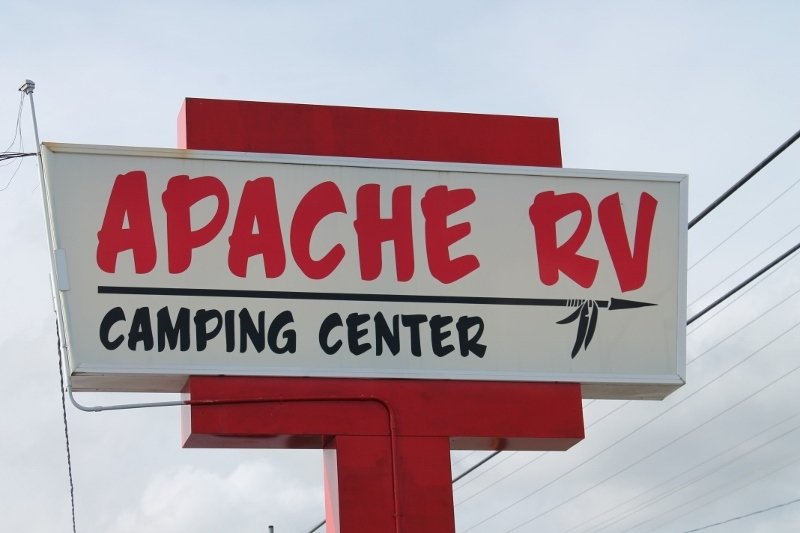 The second dealer, Apache Camping Center, was in Everett, Washington. Let’s see, that’s 10 states away and nearly 3,000 miles. But they had a brand new 26RLS in the interior color we loved. What if we got out there, took one look at the Creek Side and decided it wasn’t as good a fit as we thought it would be? 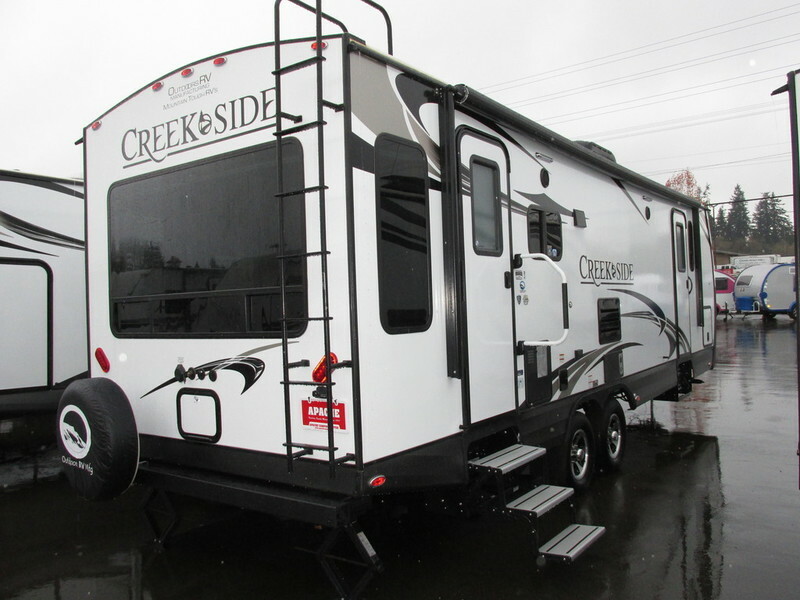 Don, our sales rep, assured us that if we didn’t like the Creek Side and didn’t see another travel trailer on the lot that we liked, our deposit would be refunded. He also told us that, since the 26RLS was now a discontinued model, they were anxious to move it and he offered us a great price. Again, just perfect! Could the dream really be within reach? The date was March 1st. Apache was willing to hold the Creek Side for a reasonable length of time, allowing us to get our ducks in a row at home and make the drive out to pick it up. But we knew (and completely understood) that they wouldn’t be able to hold it until our west coast trip four or five months down the road. Add to the mix a business commitment that began April 1st and we knew that we’d have to make a quick, out and back, cross country trip before the end of March. A flurry of activity followed. Since our daughter was in her senior year of high school and driving, getting to and from school and work wouldn’t be a problem but we needed to line up someone to authorize medical treatment, if necessary (her big brother), someone to be available to sign school paperwork that might come up (her helpful principal) and someone to provide a home-cooked meal or two while we were gone (her devoted aunts and uncles). Plan D was looking good! On March 14, 2017, a late nor’easter dumped so much snow on the northeast that our scheduled departure was delayed for two days. We left on March 18th, with only 14 days to drive out to the west coast, buy the travel trailer, and get back home before April 1st. Yes, I guess we sometimes do live life on the edge. We were praying hard that no late season storms out west would delay us and hoping that the mountain passes we’d need to cross on the way home would be clear of snow and safe to travel while towing the new RV. The last thing we wanted to do was drop down along the west coast, head east across the southernmost states and then travel back up the east coast. But, in for a dime, in for a dollar – we knew we’d do whatever we needed to in order to get ourselves and the Creek Side home safely. This would be a good time to stop for a bathroom break if you did, in fact, refill your coffee cup earlier. Go ahead, I’ll wait. 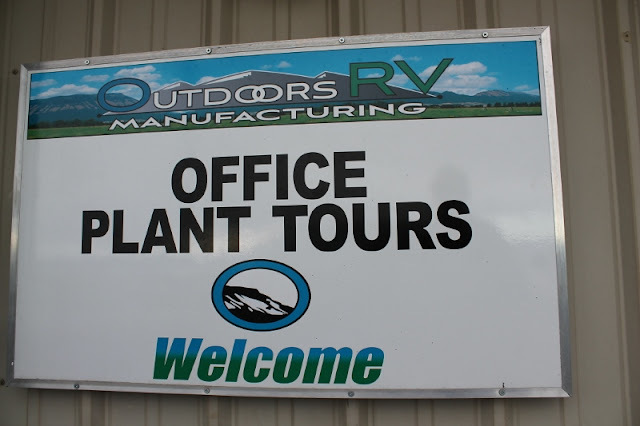 On our way out to Washington, we stopped at the Outdoors RV Manufacturing factory in La Grande, Oregon, for a factory tour. Our tour guides, Kevin and Tara, were absolutely delightful and it was both amazing and educational to see the process of building an RV from the ground up. Dropping south into Oregon so that we could stop in La Grande was something Alan very much wanted to do. As it turned out, it only added a little over 100 miles to the trip and it provided us with a real connection to the company and the people that build these wonderful RVs so that folks like us can make the most of our time in the great outdoors. 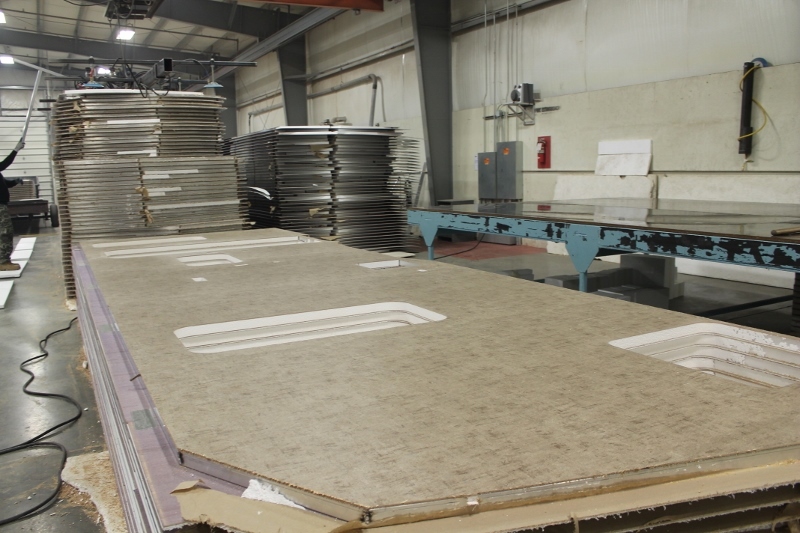 ORV invested in precision cutting equipment to ensure that insulation fits EXACTLY as it should! Smaller pieces parts work together to make bigger pieces parts - like walls! Look! Almost done and out the door! You gotta love those windows! We arrived in Everett, Washington, on the evening of March 22nd, and headed over to the Apache Camping Center (link HERE) first thing the next morning. I’m sure you’ve figured out by now that we fell in love with the Creek Side. Alan and I had done so much research and looked at so many photos online that it felt like home the minute we walked into it. Our single disappointment was that Don, our Apache sales rep, was out of town that week and we missed the opportunity to meet him. However, he had left our paperwork all set and ready to go. Sarah, one of Don’s colleagues, walked us through it and then passed us off to Steve in Apache’s Service Department for our pre-delivery inspection and walk-through. Sarah, Steve and the other Apache staff members we met were both welcoming and professional and we wouldn’t hesitate to do business with them again. Exactly one year ago today, Alan and I pulled out of the Apache Camping Center in Everett, Washington, stopped to fill our propane tanks and headed over to Anthony’s Homeport for a celebratory lunch. (Don’t worry – no alcohol was involved.) Then it was on to Deception Pass State Park on Whidbey Island for a two night “shakedown.” One of the best parts about this trip was that we were able to completely surprise my childhood friend Valerie for her birthday with the help of her husband Charles. They live on Whidbey and we don’t get to see them very often. The look on Val’s face alone was worth the entire trip! All in all, the cross country trip was five days out, two days there and six days back. No snow storms and, fortunately, we weren't stopped by law enforcement once - despite the fact that our three day trip permit had expired after the first day on the road and we were traveling without tags on the trailer. 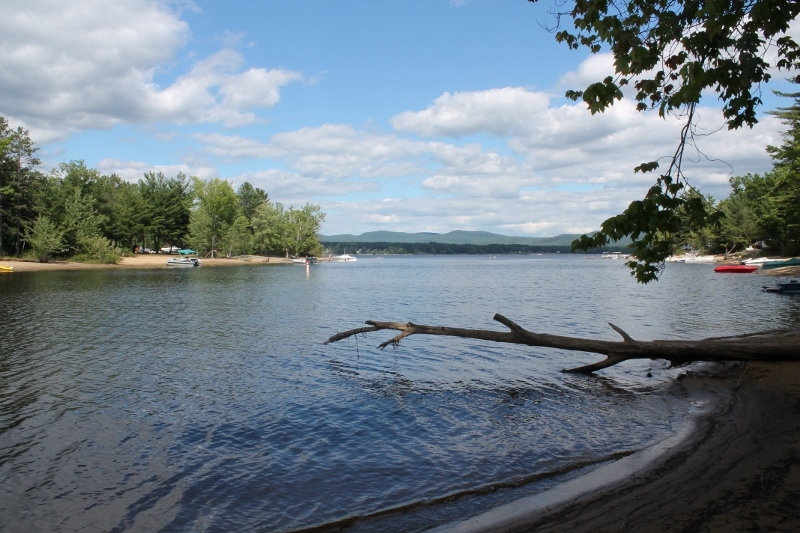 Some days, it's still hard to believe - we drove 6,880 miles to buy a travel trailer. Yup, some people will do anything to add a little adventure to their lives. But I have to tell you, Alan and I knew in our hearts and we both agreed, even before we left Deception Pass, that the decision to pursue this dream was one we would never regret. Please note that, aside from meeting some really wonderful people at both Outdoors RV Manufacturing and Apache Camping Center, I am in no way affiliated with them. This was not a paid post and I didn’t receive any compensation from either company. This was really an incredible experience for us and I just wanted to share the story – and our enthusiasm – with you. Now, go out and make some of your own dreams come true! I would sincerely be interested in learning whether or not you enjoyed a post of this length. Please feel free to let me know – either in the comment section below or by emailing me at reflectionsaroundthecampfire(at)gmail(dot)com. Thank you! That's an interesting point, especially since I do often find myself going back to re-word a sentence because it "didn't sound like me." Thanks for the comment, Kevin! I am one of whose who read blogs more for their written content rather than the photos, for it is what they think or feel about their subject that really matters to me. In fact, if I see a blog that consists mostly of photos and very little writing, it gets rejected offhand from my reading list. Not only does your blog satisfy this requirement in spades, but your writing style and the flawless mechanics involved have elevated it to first place! It has been a very long time, if ever, that I have read a post this elegant and devoid of any error. (Yes, I am a grammar Nazi, and I would have found it.) Kudos for using your skill to create a lasting treasure for your memories when your traveling days are done. And thanks for sharing it with those (like me) who can really appreciate your talent. And by the way, thanks for your comments on "Phannie and Mae." Wow! I am humbled by and grateful for your very kind words, Mike! Although I've been out of the workforce for nearly two years, it has only been over the past year or so that I've been able to spend time writing for personal pleasure. This blog has been on the back burner for a long time; launching it allowed me to cross an item off my Bucket List. I'm delighted to know that there are readers (like you) who enjoy it - you're welcome to pull up a camp chair and chat any time! Thank you, again, for your heartwarming comments!